Across numerous vertical industries, enterprises are challenged to improve processing efficiency as transactions flow from their business communities to their internal systems and vice versa, simplify management and expansion of the external communities, accommodate customer and supplier preferences, govern the flow of information, enforce policy and standards, and protect sensitive information. Throughout this process, external partners must be on-boarded and off-boarded, information must flow across multiple communications infrastructures, and data must be mapped and transformed for consumption across multiple applications. Some transactions require synchronous or real-time processing while others are of a more periodic nature. For some classes of customer or supplier, the enterprise might prefer a locally-managed, on-premise solution. For some types of communities (often small businesses), an as-a-Service solution might be the best option. Many large enterprises combine the on-premise and as-a-Service approach to serve different categories of business partners (customers or suppliers). 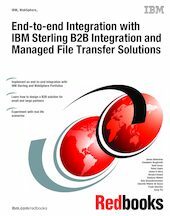 This IBM® Redbooks® publication focuses on solutions for end-to-end integration in complex value chains and presents several end-to-end common integration scenarios with IBM Sterling and IBM WebSphere® portfolios. We believe that this publication will be a reference for IT Specialists and IT Architects implementing an integration solution architecture involving IBM Sterling and IBM WebSphere portfolios.